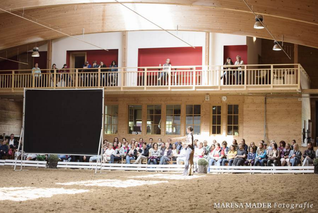 Anja Beran's International Classical Dressage Workshop "Get the spirit"
Anja Beran is a well-known classical dressage trainer based in Southern Germany. The horses’ well-being, both in training and husbandry, is central to her philosophy. Every summer, she organises a one-week workshop in English to explain her training approach by showing the horses that are currently in training with her. That includes horses from different breeds at all training levels from starting under saddle to advanced performance. At this year’s workshop, she will focus on evaluating the quality of a horse’s movement. In short: Train your eye! Anja Beran auf dem Lipizzanerhengst "Favory Toscana"
Anja Beran’s workshop takes place at her barn Gut Rosenhof from 18 to 23 July 2016, with a free day on Wednesday, 20 July. For more information on the classical dressage workshop please consult Anja Beran’s website. For registration to the workshop, please send an email to anjaberan@gmx.net. inviting Alexandra Kurland, pioneer in equine clicker training and specialist in equine balance. Sunday before Anja Beran’s Classical Dressage workshop and on the workshop-free day, Wednesday, workshop participants have the opportunity to learn from and with Alexandra Kurland. Alexandra Kurland is a teacher of balance and a pioneer in the development of equine clicker training. She very quickly recognized the power of clicker training for improving performance, for enhancing the relationship people have with their horses, and for just plain putting fun back into training. Today through her books, videos, clinics and many articles, she has become a leading voice in the development of clicker training in the horse community. 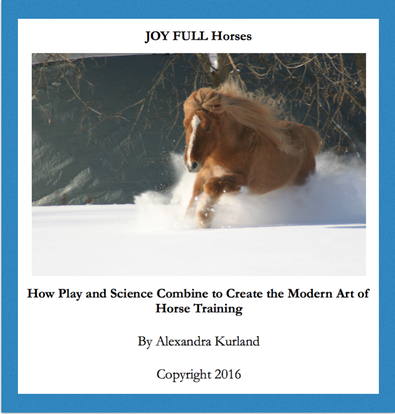 Alexandra has just written a new book “JOY FULL Horses – How play and science combine to create the modern art of horse training”, which she generously shares on her blog http://theclickercenterblog.com/ and we will certainly discuss this during the workshop. During these two days we will be engaging our brains and our bodies. We will use the teaching tool of simulation which allows us to explore, test, adjust, and re-test without having to worry about our horses. Simulation allow us to slow things down and perfect them, to test alternative ways and see the difference, to make errors and assess their effects without messing up our horses and to find and repeat perfect practice. Apart from inspiring discussions and simulations, we will also be playing to have fun AND enhance our understanding. We will play with movement in balance in a concept that Alex calls Microriding and with shaping strategies using a table top game called PORTL. In these two days, we’ll be exploring Microriding, observing and feeling in slow motion the balance shifts that the horses and riders experience during the rides that we get to see during the workshop. What weight shift are needed to get a shoulder-in in balance, what effect does it have, if you “fall through your outside shoulder”. Can you stop in your shoulder-in at any point and reverse or do you need a rebalancing step to avoid falling over? How does this translate to your horse doing a shouder-in? How can you create subtle balance shifts within your body shifts to create a great trot transition? PORTL, which stands for Portable Operant Research and Teaching Lab, is a tabletop shaping game that teaches individuals about behavior and shaping. Through playing the game, individuals get to see the principles of behavior in action and practice applying those principles to change behaviour. PORTL was developed by English dog trainer Kay Laurence who called it GENABACAB. Kay used it to teach her students about the basics of shaping and to improve their timing and observation skills before training their dogs. It is another way of simulating a training session by testing your training strategy. We will explore the connections between classical dressage and clicker training and how the clicker training lessons build the foundation for performance as we get to see it during the workshop. At first sight, it may appear as though Alexandra’s lessons were completely different from classical dressage when in fact they are strongly linked. They give you the skills needed to achieve your riding goals whether they are classical dressage or other goals. For more information on the similarities and connections between Anja Beran’s classical dressage training and Alexandra Kurland’s clicker training read this article. The participants will have the unique opportunity to get assistance from three of Alexandra's experienced training coaches: Marla Foreman from USA/Canada, Mary Concannon from Ireland and Michaela Hempen from Germany/Italy. This will provide many opportunities of one-to-one teaching and for the those attending the online course to meet the coaches in person. Marla is a veterinarian, professional trainer and riding instructor. She is currently resident trainer at the Cavalia farm in Sutton, Canada, where Alexandra is frequently consulting and holding clinics. Marla and her AngloArab mare named Beauty appear in Alexandra’s online course and in the DVD Lesson 12: Riding on a Triangle DVD. The focused and organized clicker training with Alex helped her take Beauty from a very nervous horse who was in constant motion to successfully competing in Intermediate eventing. Marla has worked with many many horses since then. Mary worked as a researcher and university lecturer in microbiology and is now a full-time horse trainer. She teaches clicker training at her Irish clicker centre and gives clinics in many different countries. She came to clicker training through Newbie, a then 3 year old Thoroughbred, who did not trust humans very much and bucked as soon as he felt the girth closing around his belly. With clicker training and patience, Newbie is now a clicker super star. He appears in ‘The-Click-That-Teaches’ online course. Michaela is a veterinarian and scientist. She is based in Italy and is teaching clicker training in her free time. Michaela is fascinated by the science of behaviour and classical dressage. She regularly visits Anja Beran and combines what she learnt from her with clicker training. She came to clicker training through her Arabian cross Asfaloth. He couldn’t stand still and attempted to bite whenever you came near his head. He was so stiff that he could not trot properly because his crookedness blocked him. With clicker training and classical dressage he became a more serene, relaxed and balanced horse. We will explore different aspects of equine clicker training. Alexandra will talk about the importance of PLAY for training and we will deepen our understanding through actively playing Microriding and PORTL games. We will be attending Anja Beran’s Classical Dressage workshop. Alexandra and her training colleagues Kay Laurence, Jesus Rosales Ruiz and Ken Ramirez have created a new conference style applied first at the Five Go To Sea cruises and later at the Training thoughtfully conference, were the questions arising from the discussion guide the flow of the presentations. This allows not only a more interactive programme but also a more profound learning process. In that sense we do not decide on the programme content beforehand but let the questions that arise in the process guide our focus for learning – playfully cruise-style! On Friday, Anja will take us to Circus Krone. The circus sends their young horses to Anja for training in preparation to their long term career at the circus. Programme may change, please consult Anja Beran’s website for programme details. For those who can't get enough, we'll be having informal lunch and dinner together with Alexandra during the whole week which provides ample opportunity for continuous discussion and PORTL games. Join us! Cancellation until 29 February 2016: 100% refund. Cancellation after 31 March 2016: 0% refund. Payment through bank transfer or Paypal. Send an email to michaela@clickertrainingpferde.com to register to the JoyFull Training Workshop with Alexandra Kurland. Send Payment (€300) for the JoyFull Training Workshop with Alexandra Kurland either via Paypal button below or by bank transfer. Please organise your own accommodation. Alternatively consult the list of accommodations on Anja Beran’s website. The nearest airports are Munich (MUC) and Memmingen (Allgäu Airport, Ryan Air). Consider renting a car if you arrive by plane. The easiest way to get to Anja Beran is by car. From Munich airport it is a 1h 15minutes’ drive. From Memmingen it is a 40 minutes’ drive. Alternatively, take the train to Schongau. Most convenient is the arrival by car.